Santa’s still in the giving mood. Anyone interested? Thank you Randomuzings. 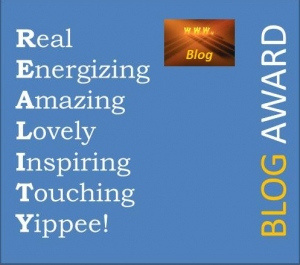 I feel deeply honored that you think my blog is worthy of this award. Collect the star and grab some more before it ends! Thanks Vina for the lovely award. I am truly grateful. A. If I could, I would change and reverse the environmental damage we humans have done to the Earth. A. I would be 21. Just out of college and you have all the confidence in the world and you think you can take the world in your stride. 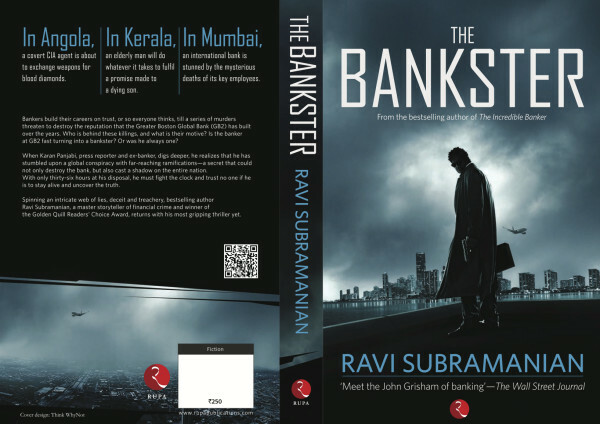 The Bankster is a thriller written by Ravi Subramanian. I hadn’t read any of his earlier works so I started with a blank slate. If I have to write a one-word review for the book that would be “Brilliant!”. I just loved reading the book and what’s more interesting is that immediately after I put down the book I was on the net researching the facts. The story just stayed on for a while even after I had finished reading the book. At times the scenes sounded very Bollywoodish but which Indian doesn’t love Bollywood drama. Though the title sounds like a piece of fiction on the banking industry, it involves much more than that. The author narrates three stories in the book. 1. First about a CIA agent involved in a weapons deal in exchange for blood diamonds in Angola. 2. A man from Kerala, who wants to seek justice for people in his region, as per the promise made to his dying son years ago. 3. An International retail bank in Mumbai, some of whose employees are found dead mysteriously. Then he finally strings the three stories together to connect the dots and create a masterpiece of a story. What I found interesting is the International angle to the story. Stringing all the incidents together as a part of a global conspiracy involving the likes of the CIA, crime syndicate, resource-rich, war-stricken nations and the major World Powers. It is nice to see an Indian author weave a story involving the Cold war, the Chernobyl disaster, the Fukushima nuclear disaster and the proxy wars in Africa. Like they say in Hindi “Haathi ke daant khane ke alag, dikhane ke alag”, the face put up by nations and their actions are quite different from their behind-the-screens behaviour. The power politics played by the big nations and the covert operations of the likes of CIA isn’t a new topic and quite a few Hollywood movies have successfully used this to make hit movies. The use of arms trade to further foreign policy objectives is quite obvious in the middle-east and Africa but does it happen even in India? Or may be it happens in a slightly different form here. God only knows or may be some closer to God would also know. The fact the author talks about some very recent happenings in our country makes you wonder which part of the book is fiction and which is a fact. The book spans across finance, World-politics, corporate-politics, romance, crime and mystery. The author has dealt with some very current and relevant topics like money laundering, foreign-funded NGOs mis-using the funds and very cleverly stayed clear of the religious angle of it. The Wall Street Journal has rightly called Ravi Subramanian ‘The John Grisham of Banking’. Next, I will pick up other books of his that I haven’t read. My Tasty Curry: Breakfast with George Colambaris Masterchef Australia at Olive Beach New Delhi. When I hear Ashwin Sanghi, I get reminded of Chanakya’s Chant and the masterpiece it was. Knowing history thoroughly well and drawing parallels requires great deal of research and amazing creativity. If you think that is difficult try being a conspiracy theorist. Digging into history and mythology, drawing parallels, using existing places, artifacts and research data and making a story around it is indeed a commendable job. Kudos to Ashwin Sanghi for that. The story is a first person narrative by Krishna and the author has maintained the same style of writing as before. alternating between the distant past and a present day parallel. The book is a great read for those who would like to know more about Mahabharata and Krishna’s life history. Very enlightening in terms of research related to Indus Valley Civilization and the third(invisible river) of the rivers from the Triveni Sangam, “The Saraswati”. The facts are provided in such a way that leaves you wondering if the work indeed is a work of fiction. The pace of the book is pretty decent. That was for the good part. The not so nice part is the book holds your attention in the beginning but fails as it progresses further. Much like a great movie before interval but starts failing just after it. I was disappointed with the ending. Not because of it’s spiritual ending (the author is free to write an ending that pleases him) but because there was no clarity about what happens to Taarak Vakil, the supposed tenth avatar of Krishna or the Kalki. Also, I felt the author is trying to string too many conspiracy theories into one book when he also brought the Taj conspiracy into picture. When I started reading I was happy that India has found it’s very own “Dan Brown” but at times he sounds a tad too Dan Brownish. The striking similarity between this work and a Dan Brown work is a little disappointing for me personally. Also, Confusing Radhika for Priya in some pages, isn’t great editorial work. I found three such instances in pages 301, 389 and 456 where Radhika is mentioned as Priya. Especially the first one, I was reading fully engrossed and the line said “Priya had then been lowered to the base of the mountain” and I was caught off-guard. It took me a moment and re-reading a few lines again to realise it is a mistake. Nonetheless, it had already done the damage by interrupting the flow. Overall, though the book is a great read and does give you a lot of ‘aha’ moments and I would definitely recommend the book. Though packed with history doesn’t make you feel overwhelmed. Especially if you are an aficionado for history or conspiracy theories, you must read this. P.S: On a somewhat related note, I would someday like to see a program on history channel, a theory based on this book. That would be an indication that India has truly arrived on the political scene. I love reading and watching good movies. Give me chance and I will spend an entire lifetime reading books and watching movies. 2.What do you think others think of you? Hmmm. I am not sure but two things that people invariably say about me: intelligent and silent. 3.Where do you see yourself end the next 10 years? 4. What is one quality of yours you admire the most? I think optimism. I am an incorrigible optimist. Though I do get cynical at times but it doesn’t take long to recover from those cynical bouts. 5. Have you played a trick on someone that went bad, What is it? 6.Who would you say made you who you are today (other than your parents, if that is what you would answer ). I was lucky to have some wonderful teachers, friends and some amazing bunch of people around me during my growing years. I so miss them. Staying away from home and not being in touch with many of these people makes me sad. Hmmm… listening to that wonderful song that makes you lose yourself, Paani puri, travel to a place that I have never been before, a surprise gift, a surprise phone call, sitting on the sea-shore and listening to the waves hit the shore and all those little things that make you realise life is beautiful. 8.Who is your favourite hero and Why? It started as an experiment, a place to rant, continued as a time pass. I kept going for the love of writing and sharing my thoughts. 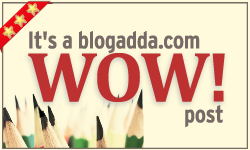 When I was demotivated the fact that my blog is read and people commented and kept coming back made me come back too. Once I discovered the real power of blogging and made some wonderful friends through it, I fell in love with it and haven’t looked back since then. 10.Do you believe in love stories , if yes why? 11.Tell us an incident that you remember always. The first time I made a friend who stayed on as my best friend and we remained so for many years to come. It was our second day at school(kindergarten) and in the tiffin break while I was trying to open my tiffin box it fell down. This girl from the same class came forward, put half of her tiffin in the lid of her tiffin box and offered it to me. 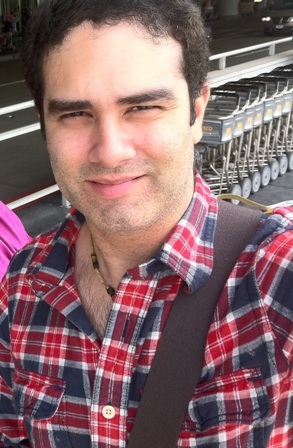 I smiled and took it. I don’t even remember if we exchanged names but that marked the beginning of wonderful journey and the happy times we shared later. 1. Given a chance, which is the one movie character you would like to play? 4. If your life were a song, what would the title be? 5. Which one would you rather have beauty, brains or strength? 6. Do you think it is the man who should be paying on a date? 7. Do you believe in ‘Love at first sight’? 8. Name one movie you really hated.